Dragon Slayer: Eiyuu Densetsu (ドラゴンスレイヤー英雄伝説), called Dragon Slayer: The Legend of Heroes outside Japan, is the sixth main game in Falcom's Dragon Slayer series, following Sorcerian. It was first released on the PC-88 in 1989 and would eventually find its way onto a number of other consoles. In 1994, Sega Falcom produced a port to the Sega Mega Drive released exclusively in Japan. As with other main series Dragon Slayer games, Eiyuu Densetsu recevied its own sequels in a subseries, the first of which is Dragon Slayer: Eiyuu Densetsu II, also ported to the Mega Drive by Sega Falcom. 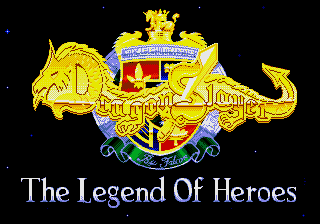 In the main series, it was followed by Lord Monarch, which also had a Mega Drive adaptation produced by Sega Falcom. Main article: Dragon Slayer: Eiyuu Densetsu/Magazine articles. NEC Retro has more information related to Dragon Slayer: Eiyuu Densetsu.